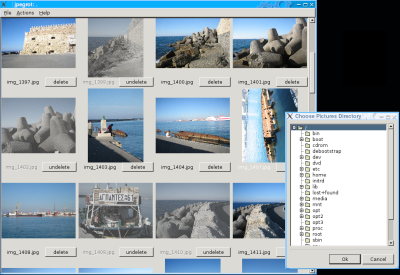 jpegrot is a interactive tool to manage one's pictures. It will display a thumbail view of the files in a chosen directory, and will let the user quickly rotate or delete some of the pictures. Exif data is used to try and make the rotating as automatic as possible. What differentiates jpegrot from other such tools is that the actual rotation of the image files is done after the user has selected the correct orientation of the thumbnails. Other tools will perform the rotation on the file immediately, and as picture files get bigger and bigger, the process becomes slow and annoying. Here only the thumbnails rotate, and only after the user has set all the orientations, all the files are modified. xcheckmail is like biff: it monitors a mailbox and warns of something has changed. But it does it in a more clever way: you can make it filter what emails you want to be warned about. It works on unix systems and requires X11/Motif. It doesn't come with much (if any) documentation, and suffers from strong code rot, but feel free contact me if you have any questions.